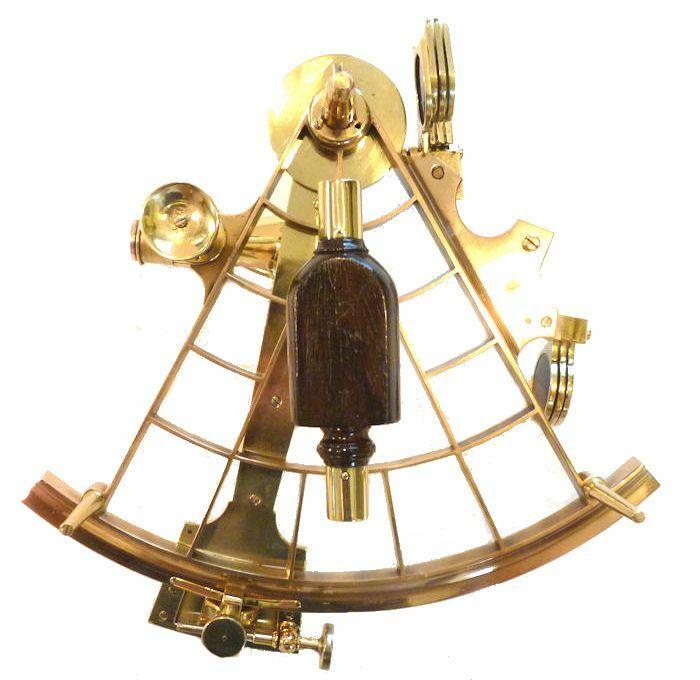 To view our current inventory of sextants, octants and other navigation instruments, click here! 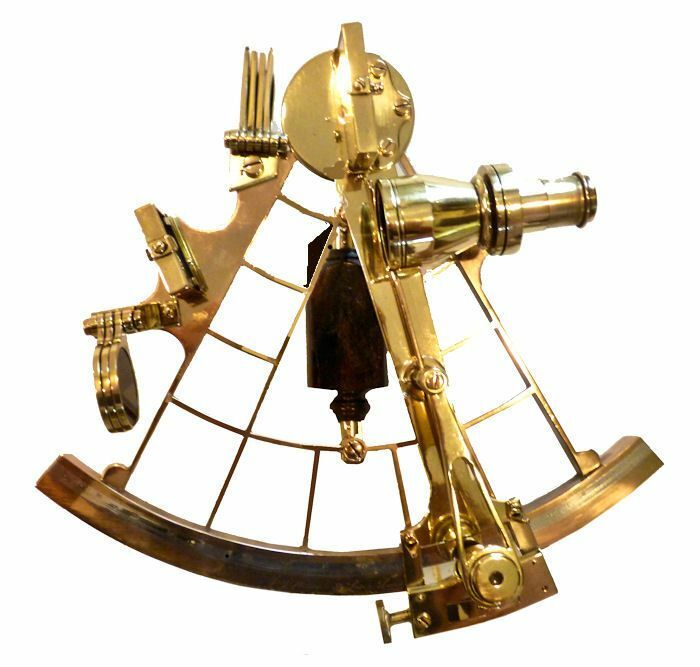 PRESENTED is the personal quinatnt-sextant of a famous mid-west yachtsman, which he used to navigate the long distance races on Lake Michigan, probably from 1935 forward until his death. He also had it with him on at least two ocean passage aboard ships. Olson was a well known Milwaukee and Chicago area yachtsman who was a commodore of the Milwaukee Yacht Club and one of the founders and first chairman of the Island (Mackinac) Goats Sailing Societey. Beyond his sailboat racing, Hobart was a very private person and little is known of his personal life other than he graduated from the University of Wisconsin in 1923. This is in contrast to his wife, Susan Bolton, ne' Hayden, a Chicago socalite whom he married in 1937. At the time of winning Class "D" in the 1941 Chicago to Mac race, Olson had sailed in nineteen of these events. His yacht at that time was " Duchess" only 31.6 feet long making her the smallest boat in the fleet. Susan Olson was equally active in sailboat racing and the boat was sometimes entered under her name. She served three years during WW II as a Navy lieutenant, commissioned a Navy destroyer, and was active in numerous civic, social and charitable organizations. Susan died in 1998 at age 93. The couple was childless. The Chicago to Mackinac Race has been soponsored by the Chicago Yacht Club since 1898. At 333 miles, it is the longest fresh water race in the world and is as challanging as any ocean race of the same distance. 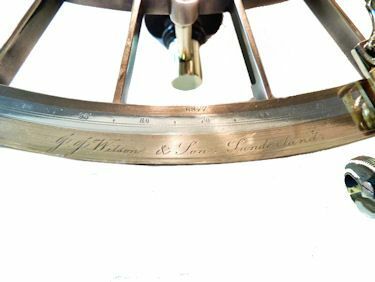 THE MAKER: Marked on the arc in the early style Copper Plate script is J.J. Wilson & Sons, Sunderland, which helps date the instrument as an early style. 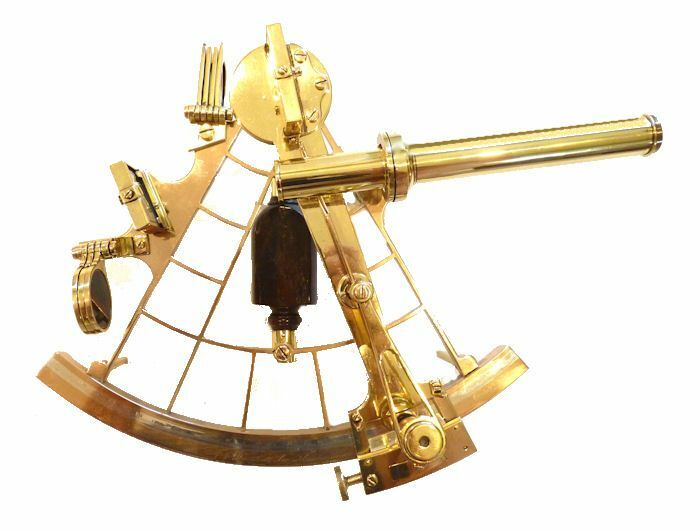 There are no other known examples of a sextant or quintant by JJ Wilson listed in the comprehensive work, Sextants at Greenwich or the Webster Database of Instrunment Makers at the Adler Planitarium, so that it likely was made by one of the better known makers such as one of the Spencer companies which its design and seral number sequence closely follows. This would account for its high quality from an unknown instrument maker. THE DESIGN is is a Mid to late 19th Century brass, ladder frame quintant reading to 150° along a graduated platinum arc with vernier, and brass fittings. The serial number 6877 is above 75° which is the same position that Spencer, Browning & Rust is know to have placed it. 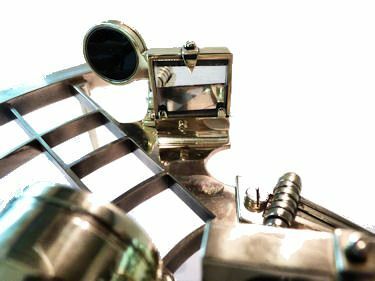 Spencer, Browning & Rust and its succesor, Spencer, Browning, were acknowledged as two of England's foremost early instrument makers and ranked alongside Throughton Brothers. 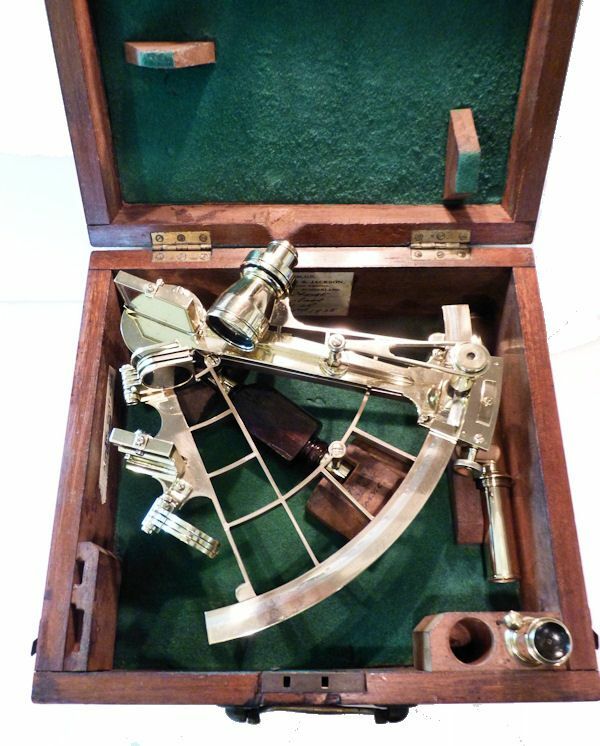 It comes with a high powered telescope for colllimation, a star scope, and a sighting tube, and is housed in a well worn Mahogany box. 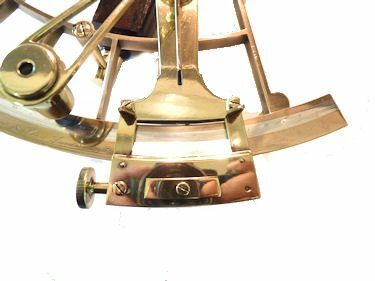 REFERENCES by omission: "Sextants at Greenwich", by Bruyns, which catalogs the collection of the British National Maritime Museum at Greenwich, England in which there is no entry. LABELS: On the top and front cover of the box: 'Union Castle Line to/from South & East Africa, MV Silverpalm, Jova, Pacific and a tax stamp. On the outside bottom: a partial sticker with the name 'Hubert Olson, date of sailing 19 June '38, from port of Southampton England'. On the inside: Service by 'Hutchinson and Jackson, Certified Compass Adjusters, Sunderland, 1935'. A partial label with the inscription 'Milwaukee Yacht Club - Dutchess'. Marked by pen on the top of a wood chock, Hobart Olsen, M.Y.C. In addtion to beong used on Lake MIchigan the quintant crossed oceans. INSTRUMENT CONDITION: The index mirror has one hazy spot, but is otherwise in excellent condition and the horizon mirror is clear and bright. The Mahogany handle has turned finials. 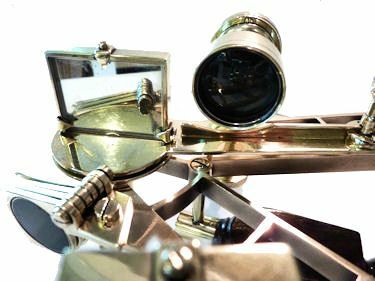 The index arm clamp, and swing arm magnifier are complete and in good working order. The holders for both sets of shades, i.e., filters are present, but one index shade has a chip on the lens and one has the glass missing. Also, missing is a glass screen over the vernier, a tiny screw on the magnifier base. and two lens filters for the ocular lens of the scopes. The original pick for adjusting the mirrors is present. The instrument was recently polished and lacquered to show its beautiful workmanship. This instrument is in overall fine condition and is suitable for a high quality collection of instruments or as a important gift. CASE: The square case has a significant age crack across the top, and bottom, but is sound. There are a series of shipping labels on the top and bottom. The instrument and it's accessories are housed in holders. There are two latches and a lock, but no key, and no handle. 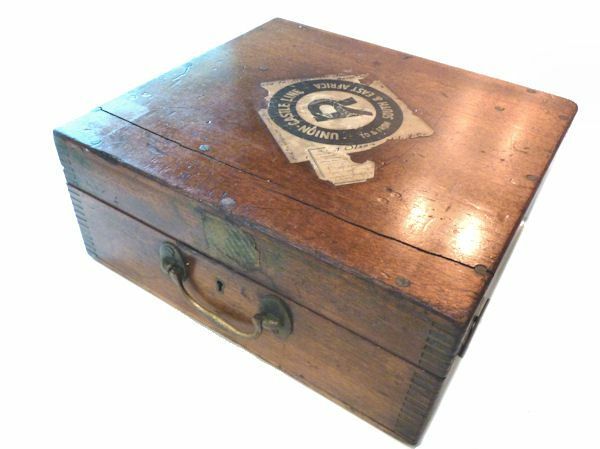 It has a wonderful old patina that only comes with natural aging. Expect the normal nicks and scrapes from years of use. All in all, a highly desirable and exceptionable example which would make a great trophy for some prestigous sailing event. Length of index arm 9 1/2"
Case 10" x10 3/4" x 4 3/4"